Historians make a distinction between "history and "History." The difference revolves around the particular epistemology used by the historian as opposed to the use of the terms by a lay person with little or no knowledge of the subject. In case you are not familiar with the term "epistemology" it is defined as an investigation of what distinguishes justified belief from opinion. In this context, "History" has a rather long and complex epistemology. On the other hand, the epistemology of genealogy is practically missing. Another definition of epistemology would extend its application to the creation of a theory of knowledge, especially with regard to its methods, validity, and scope. In my first installment in this series, I began by pointing out the ancient origin of the discussion of the epistemology of History (with a capital "H"). The distinction between "history" and "History" is the difference between history as what has happened and History as selected and interpreted as a subject of research and study. In this context, genealogy can hardly be classified as an historical pursuit. Rather than either adopting the current epistemology of those who are involved in History or even that of those in the scientific community, genealogists have avoided the issue of developing a coherent theory of genealogical knowledge and instead relied almost entirely on methodology. For this reason, genealogy is usually dismissed by academically inclined historians as a mere hobby or pastime with no real substance. The historians justify their position by pointing out that genealogists seldom either understand or care about the historical facts that constitute the context of the their accumulation of what they suppose to be facts about their families. I would point out that historians are fully justified in their derision of genealogy. For example, it is fashionable with some genealogy programs to embed the individuals entered into a "timeline" of facts about the times in which an ancestor lived with total disregard as to whether any particular ancestor either participated in or was even aware of the historical facts listed. In addition, these canned or manufactured lists of facts are then compiled into a computer generated narrative that is supposed to give the user insight into the daily life of their ancestors. This is not "history" this is fantasy. The value of these timelines does not lie in the narrative, but only in their ability to suggest further areas of research that may produce additional information about an ancestor or ancestral family. If your ancestor lived during the time of World War I, as a genealogist, you should be concerned about his or her participation in the war, but the mere fact that the World War occurred during your ancestor's lifetime does not mean that anything about how or why the war may have had an effect on your particular ancestor or his or her family. Most histories of America include the voyage of Christopher Columbus in 1492. Whether or not you accept Columbus as the discoverer of America, it should be evident that hardly anyone living at that time either knew about the voyage or was impacted by contact with America. The inclusion of an event on a timeline does not necessarily imply anything at all about our ancestors' lives. On the other hand, there are a few genealogists, usually schooled in history, that see genealogy as merely a more detailed and personal application of history. 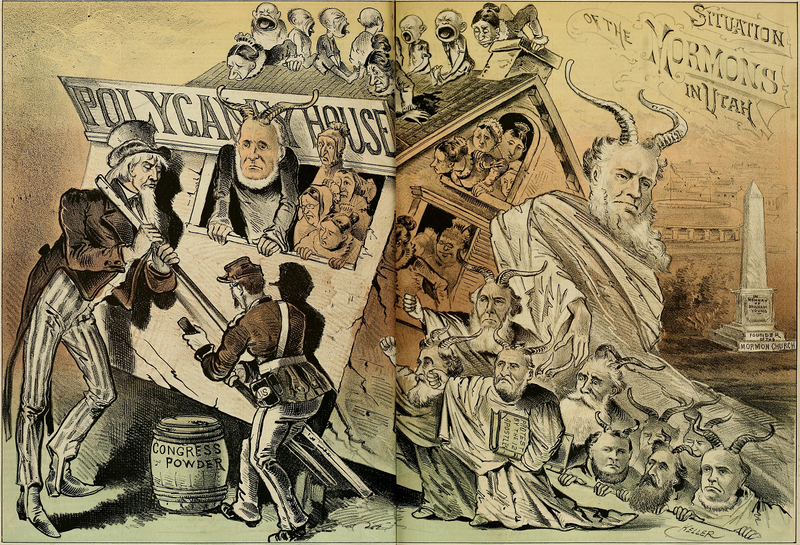 During the 19th Century, it was popular among historians to apply what is now called the "Great Man Theory" to history. That is that history is explained by focusing on the influential individuals and that the rest of humanity were merely supporting actors in chorus. During the 20th Century this view was largely replaced by the view that all men, even the more prominent ones, act in the context of their greater social environment. See Wikipedia: Great Man theory. This change in the way history was viewed is a shift in its epistemology. Viewed in this context genealogy as it is generally practiced is not History. Do we even want genealogy to be involved in the processes and interests of academic historians? If so, how does genealogy have to change? If not, is it important that genealogists discover their own epistemology separate from simplistic methodologies? Presently the genealogical process, for most researchers, involves finding a record, transcribing the contents and then moving on to the next record. Those genealogists who do reflect on the historical context of their ancestry, primarily focus on those individuals whose relationship is in dispute or for whom records have yet to be found. 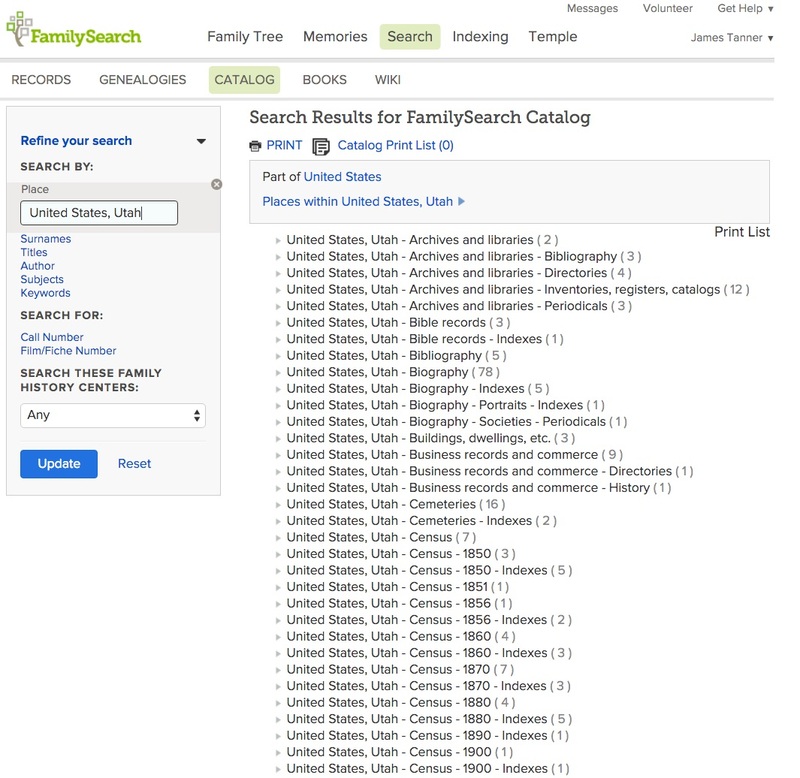 By these observations, I am not depreciating the effort and expertise of competent genealogists, I am merely pointing out that with few exceptions, they are not in business of examining the methods, validity or scope of genealogy with the objective of placing it within the context of academic History. I recently overheard a discussion among some genealogists about English parish records. The discussion centered around identifying references to both civil and ecclesiastical parishes. The participants, some of whom had been doing research for a considerable time, seemed amazed at the fact that there was a distinction. I have seen the same reaction to discussion concerning Scandinavian political and church jurisdictions also. The issue here is that there is a pervasive assumption that genealogical research can be done in a vacuum without reference to either the geographic, political, religious or social context. Lack of awareness of context of genealogical research is exactly the same class of criticism made by those who dismissed the Great Man theory of history as shortsighted and uninformed. I can remember one patron at the Mesa FamilySearch Library who became belligerent and abusive when I questioned the geographic basis for his conclusions about his family. He could see no reason why I would even question the inconsistent places he had accumulated for members of his family. Genealogy is record-based and history is record-based so the conclusion is easily made that the two have the same methods and scope. The difference can be illustrated by a hypothetical situation. Suppose I were starting to write the history of World War I. How much time should I spend tracing the ancestry of each of the soldiers who fought in the War? Genealogy is intensely fact oriented. We are concerned about each tiny detail we can extract from the records that are available. Historians are more concerned about the big picture and analyzing changes across time. The criticism of genealogy is essentially the same as that made of biographies. Biography has long been considered to be outside the realm or interest of History because of its focus on a specific time period and it lack of perspective as to changes across time. Likewise, for historians, genealogy with its focus on a particular family line, falls into exactly the same category. I see many correspondences between genealogy and anthropology, particularly kinship studies. But even with this apparent relationship, genealogists seldom extrapolate their facts into generalizations about the larger society shared by their ancestors. If genealogy is not History, then what is it? That is question I am exploring with this series of posts. The flurry of new developments that accompany RootsTech 2016 and its predecessors has begun. MyHeritage.com has announced a new Audio Recordings feature for its Mobile App. When you open a profile for someone in your family tree, you can see the headphone icon to begin a recording. I tried it out and it is extremely simple to use and effective. Here is some more info about the App from the blog post. We’ve just released a new feature in the MyHeritage mobile app: Audio Recordings. 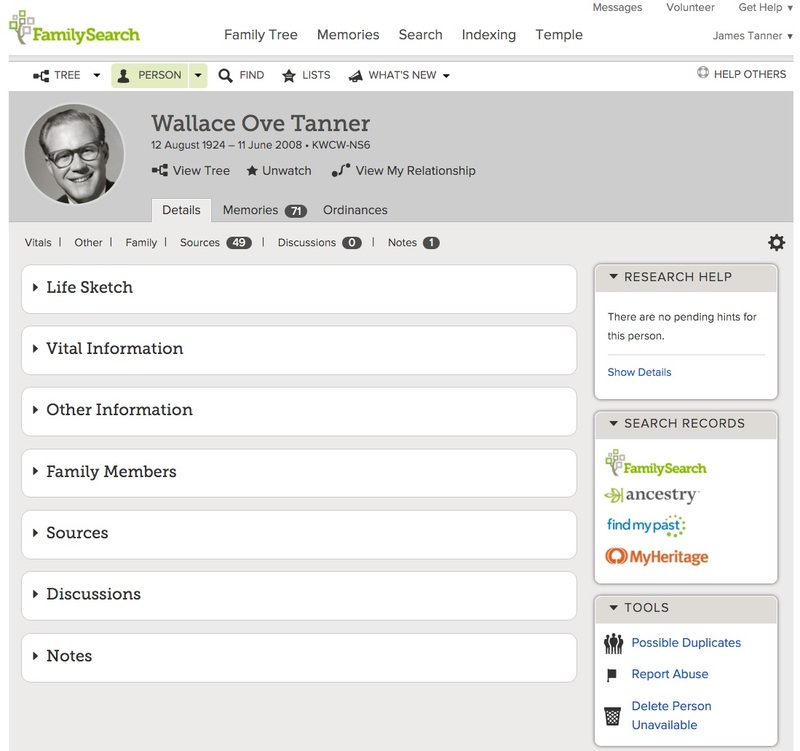 You can now interview your relatives directly from their profile in the family tree, and store your family's stories for future generations in your MyHeritage family site. The MyHeritage mobile app is free. 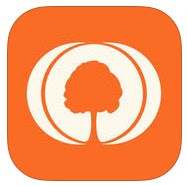 It's available for iPhone, iPad and Android, and it lets you access and enhance your family tree on the go. The Audio Recordings feature is now available in both the iOS and Android versions of the mobile app. Instructions for using the App are also in the blog post. There seem to be a few questions about the layout of the Salt Palace and parking in downtown Salt Lake City, Utah for #RootsTech 2016. Here are some links to maps and directions and points of interest that might help. I might also note that as I am writing this post it is raining and it will soon turn to snow. Here are some links to restaurants around the Salt Palace. The Salt Palace is right across the street from the West Entrance to the City Creek Shopping area, really more than a mall. Here are some links about City Creek. That should help everyone who comes to Salt Lake and is not too familiar with the area. Why are Vital Records Vital to Genealogists? Part Three -- Where are the Records? Almost every other state in the United States is going to have a similar list. For a genealogist, the existence of such records is a gold mine. But I am guessing that very few researchers are aware of the variety of certificates that are available. Here is the problem: most researchers would like to have a birth or death certificate to learn where and when a person was born or died. But in many cases, to obtain a copy of the birth or death certificate the researcher needs to know the name, date of the event and where the event occurred. It is the classic which comes first, the chicken or the egg type problem. The real question is when do these records become published and are more easily found? The answer depends entirely on the place where the event was recorded. 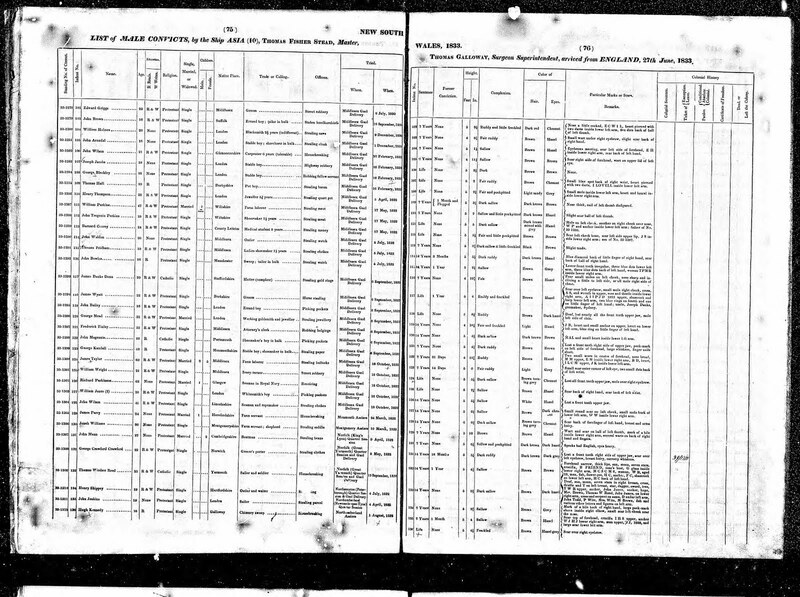 FamilySearch Blog, Online United States Birth, Marriage and Death Records, by Nathan Murphy -- These are links to the FamilySearch.org Research Wiki. The list could go on and on since copies of vital records can turn up in surprising places. You will need to search by county and by state on the internet to find additional places the records may be kept or available online and availability may change at any time. For example, FamilySearch.org is converting its microfilm collection of records to digital copies and putting the digital copies online. New records are added to the online collections almost daily and millions of new records are made available every week. A search on the day this was written produced 1,288,907,296 records with a record type of birth, baptism, christenings, marriage and death. Any discussion of vital records needs to be separated out by category and by time period. Marriage records fall into a completely different category than other vital records. Marriages have always involved property considerations. When a marriage takes place in any culture around the world, there are legal and cultural consequences. For example, in the United States, the laws around the country provide that a spouse to a marriage has some kind of inheritance rights upon a spouse's death absent some specific provision in a will or other testamentary disposition of the deceased's property. For this reason, marriage and marriage-like relationships will be addressed specifically in subsequent posts. The laws governing marriages, inheritance and probate proceedings are all closely related. Although birth and death can impact inheritance and property ownership, the laws governing marriages are far more complex. The fact is that it is relatively easy to determine if a person was born or died compared to determining whether or not a person was married. On the other hand, marriage records are more persistently kept that any other type of vital record. Of the three broad types of vital records, researchers are much more likely to find marriage records than they are an individual's birth or death record. Here are the previous installments of this series. Hollenhorst, John. “President Harrison Billboards Teach a Lesson to Utah’s Lieutenant Governor.” DeseretNews.com, January 24, 2016. http://www.deseretnews.com/article/865646096/President-Harrison-billboards-teach-a-lesson-to-Utahs-lieutenant-governor.html?pg=all. What has this got to do with genealogy? (The usual question). My wife and I have been seeing billboards up and down the freeway from Salt Lake City to Provo advertising the upcoming RootsTech 2016 Conference in Salt Lake City, Utah on February 4-6, 2016. The news stories about the Harrison billboards indicated that the study learned that the general awareness of the 9th President increased due to the advertising exposure. As far as I remember, this is the first time I have ever seen a billboard advertising anything having to do with genealogy or family history. I remember doing some billboard advertising for the computer store I owned years ago in Mesa, Arizona. We had no way to measure the effectiveness of the ads that were spread all around the Phoenix area. I am not sure now that we ever found anyone who came to our store just because of the billboards. It seems logical that an event, such as #RootsTech 2016 can be advertised here in Utah. But I am sure that just like the Harrison billboards, without some explanation, many people will be puzzled about the subject of the ads. But this does bring up a question: is genealogy a product or a service or whatever that can be advertised? Events such as home shows, gun shows and other conferences and shows are regularly advertised by billboard. Apparently, those people who put on these conferences see a connection between people coming to the show or conference and increased sales or interest in the products on display. Can the same thing be said about genealogy? Can we sell genealogy to the public like skiing in Utah or going to Utah's National Parks? Maybe there is something about genealogy I have been missing all these years. I suppose that we can put genealogy in the same category as public service advertising like the billboards about cancer and smoking and such. Would the billboards be more effective if they tried to stop people from doing genealogy instead to trying to get them to go to a conference about genealogy? This turns out to be a rather complex issue. I have seen hundreds (thousands) of billboards for homes shows, boat shows, car shows and gun shows and interestingly, I do remember going to at least one boat show with a group of Boy Scouts when we were invited by one of the participants to attend without charge. I think this type of advertising works best as a type of affinity advertising. In other words, if you are interested in guns, you are more likely to go to a gun show than someone who has no such interest. So are the billboards advertising #RootsTech 2016 out there to raise awareness like the Harrison billboards or are they intended to attract already interested people like the gun show billboards? One thing for sure, the vendors on the Exhibit Floor at #RootsTech 2016 will probably appreciate the extra exposure. 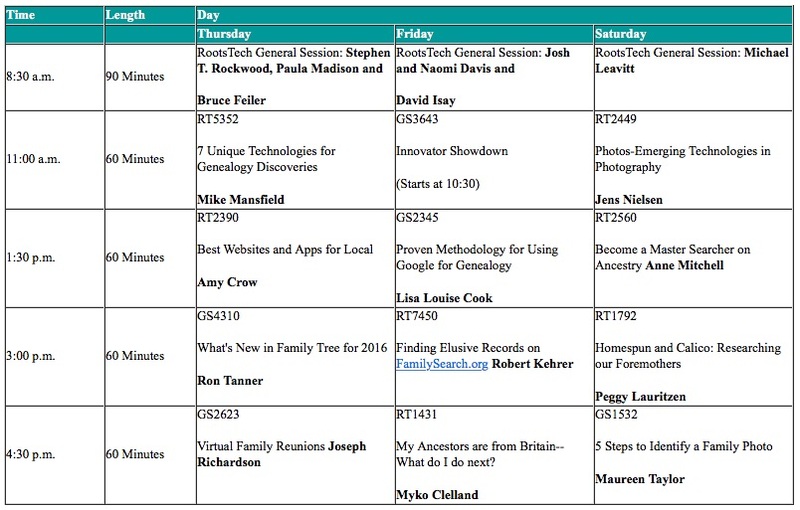 For those of you out there who cannot come to Salt Lake City, Utah for the annual #RootsTech 2016 Conference, FamilySearch has announced the upcoming broadcast schedule of presentations. It looks like the keynotes and four additional presentations will be broadcast each day. Here is the announcement and the schedule. SALT LAKE CITY, 29 January 2016—RootsTech, the world’s largest family history and technology conference held in Salt Lake City, Utah, February 4-6, 2016, announced today that 15 of its popular sessions will be broadcast live and complimentary over the Internet. The live broadcasts will give those unable to attend in-person worldwide a sample of this year’s conference content. Interested viewers can watch the live presentations at RootsTech.org. Saturday's Family Discovery Day sessions will be broadcast live on LDS.org. Note: Sorry about the quality of the schedules. They were embedded tables that did not format properly. If you click on the images, they are easier to read. I found out about this today and don't rightly know what to think about it. Don't get me wrong. I think customization and personalization are right nice, but when I have to try to explain to someone who is already confused why the stuff on screens on a software program keep moving around, I begin to question my dedication to progress. Just because you can do something, does not mean you should always do it. Do you see anything new or different? Here you go. This time I will point it out. OK, so now I have moved all of the Detail Page views around in the whole program. But it only shows up for me, I hope. Can I remember the way the page was originally? What I am saying is every person on my Family Tree now has my "new" arrangement. Now when I do demos of the program, I will have to make sure that everyone knows that their own screen may not look like what is in the manuals, Help Center etc. for screenshots. Now I can move all of them back or around or whatever and see what is going on. By the way, did you notice that I put the Tools section up next to the Search Records? I like it better that way. In the past, the #RootsTech Conferences featured genealogy industry leaders as the Keynote Speakers. During the past two years, RootsTech has evolved in the keynote speakers now feature celebrities including bloggers, writers, and even entertainers. By attending the keynotes participants could learn about new developments from the genealogical companies. Now, that same information will be available at the conference but it will be a little more difficult to discover. I will be attending the conference beginning on Tuesday, February 2, 2016 at the Brigham Young University Family History Technology Workshop at Brigham Young University in Provo, Utah. At the Workshop, I will be making two presentations and doing a demonstration of The Family History Guide website/app. 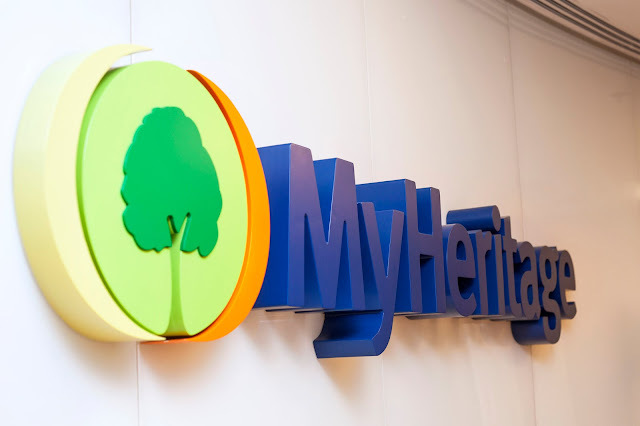 During the #RootsTech 2016 conference on Thursday, February 4th and Saturday, February 6th, I will be doing two short presentations at the MyHeritage.com booth on the Exhibit Floor. At times during the RootsTech 2016 Conference, I will also be signing copies of the twelve books we have published by Family History Expos during the past year at their booth near the FamilySearch.org booth and the Media Hub. If you buy a book and see me at the Conference, I would be glad to sign it for you if I am not at the Family History Expos booth when you come by. Meanwhile, as usual, I will be talking, writing and passing along any new developments I learn about at the conference. I plan to attend the Innovators Summit on and the 2016 RootsTech Innovator Showdown on Friday at 10:30 in Hall D. If you cannot attend the Conference or miss some of the new developments, I will try to cover as much as I can during the conference and of course, will give full updates after it is all over for this year. I may get the opportunity to talk to the participants. In the past, there have always been some new or innovative changes announced, but it seems that during the last few months it seems that new programs, updates and new features have been implemented without much fan fair from the companies. New programs face a daunting task of trying to gain the attention of genealogists. The genealogical community as a whole is highly diverse and there are no overwhelming media outlets directed solely at genealogists. Most information is passed by word-of-mouth from one person to another. There are very few genealogy companies that can be said to have a wider, outside of the community, visibility. 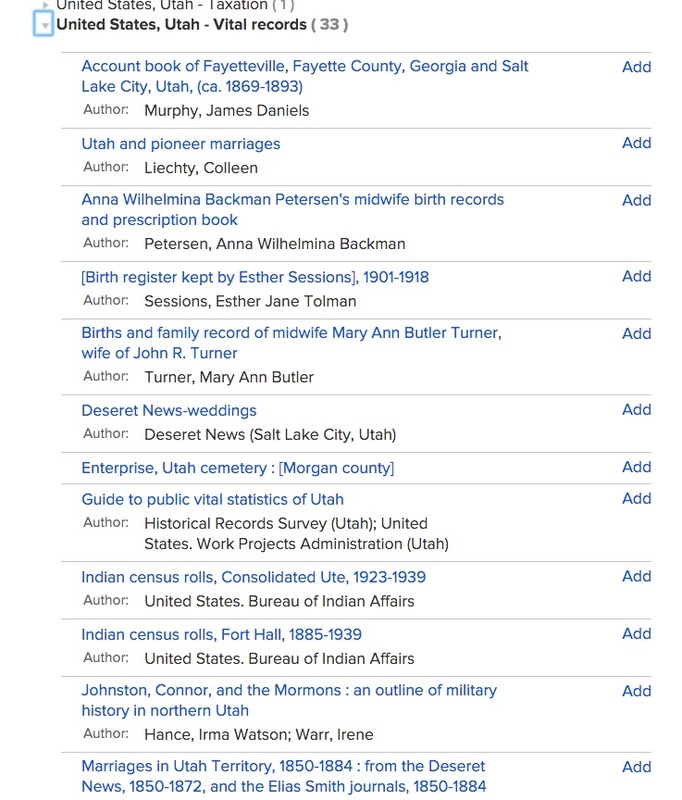 A conference such as #RootsTech 2016, gives new entrants about as much exposure as is possible given the dynamics of the genealogical community. I have never seen a study or survey on "brand loyalty" in the genealogical community but then again, you have to be aware that Personal Ancestral File is still one of the most popular and used programs and it has not been updated or advertised for over 13 years. It is hard to compete with a ghost especially a free ghost. For example, have you seen that you can move the fields around on the Detail Page of the FamilySearch.org Family Tree? Do you know how to do this? Do you even know what I am writing about? See. Almost all the people alive today, at least in the United States, probably have or will have birth, marriage and death records prepared by a government agency. Those who are beginning to investigate their family history often expect to find copies of birth, marriage and death certificates. It is the case that these documents may be available but there are always exceptions. The reality of vital records is that they are a relatively recent innovation. Genealogists refer to some of the early efforts to record information about the general population of a country "civil registration." 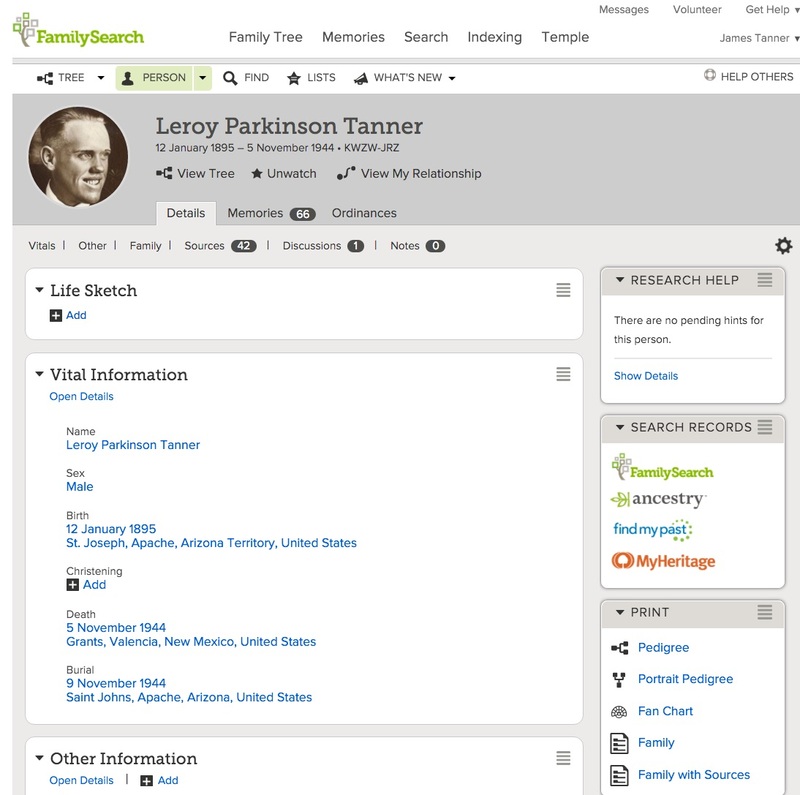 We can get an idea of when governments around the world began keeping records of births, deaths and marriages by looking at each category of such records in the FamilySearch.org Catalog. FamilySearch.org and its predecessor organization the Genealogical Society of Utah have been amassing a microfilmed collection of the world's records since 1938. Presently there are over 2.4 million rolls of microfilm stored in a huge tunnel in the mountains called the Granite Vault near Salt Lake City, Utah. 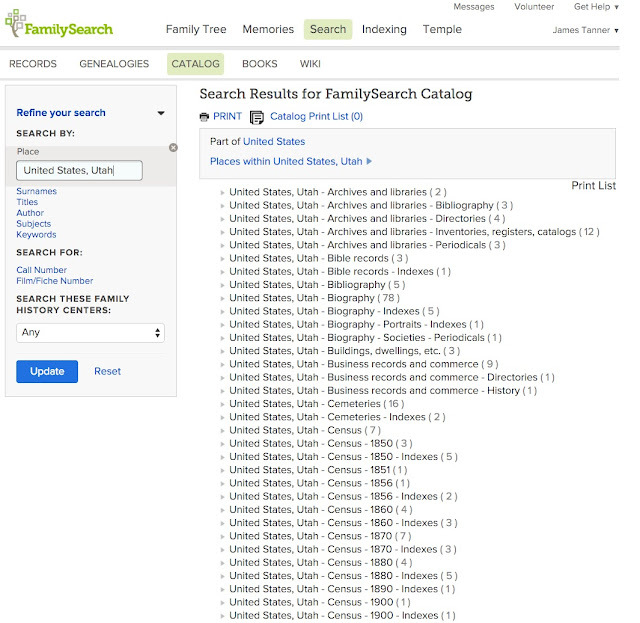 The FamilySearch.org Catalog provides a listing of substantially all of the records. Because of the advances in technology, the microfilm cameras used by FamilySearch to acquire additional records around the world were replaced by digital cameras and millions of additional records are still being added each year. 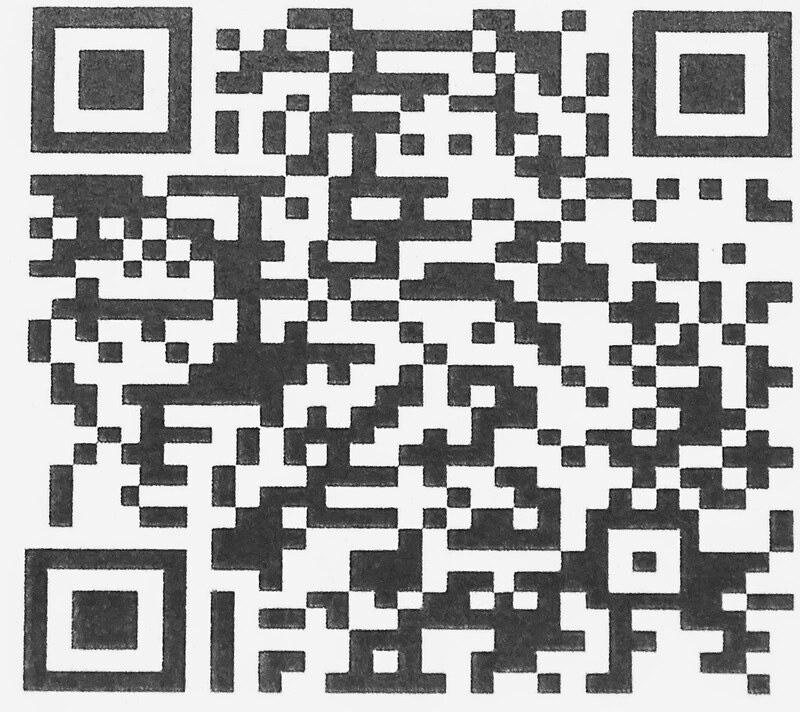 All of the older microfilm copies of the world's records are now being digitized and made freely available on the Internet in the Historical Record Collections section of FamilySearch.org. 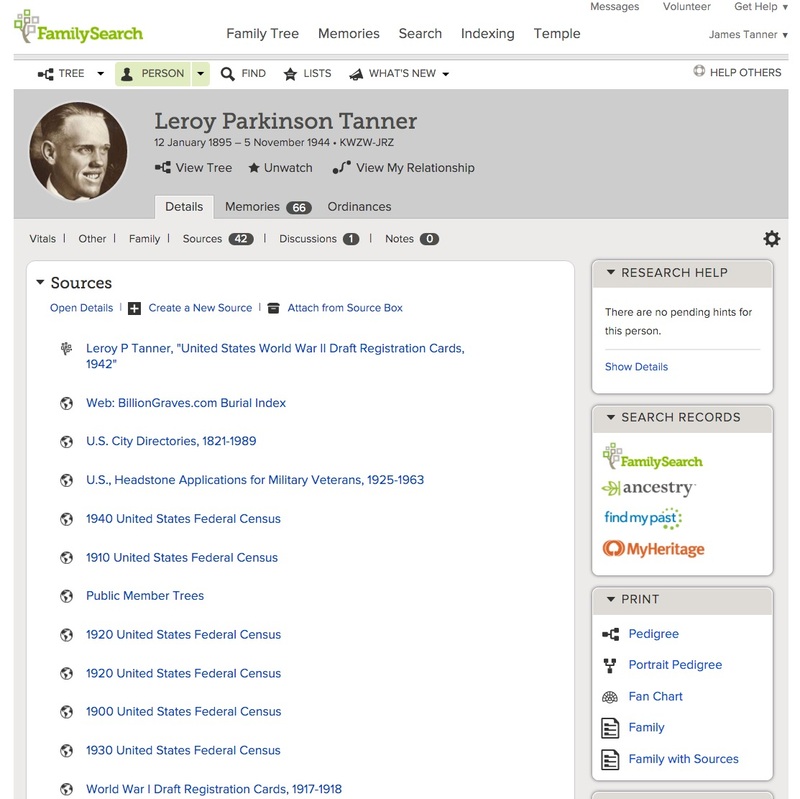 The FamilySearch.org Catalog contains entries for both the digitized records that are available online and the microfilmed records that are still in the process of being digitized. The records that are still in microfilm format can be rented directly from FamilySearch.org for viewing in a local Family History Center. 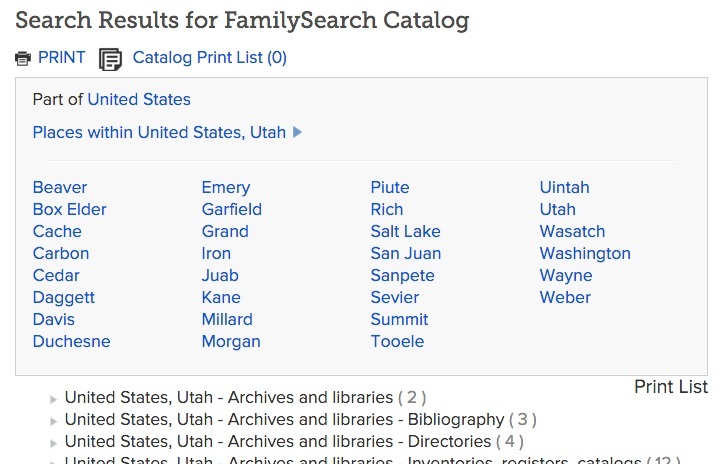 In addition, the Catalog contains entries for all of the other items kept in the Family History Library in Salt Lake City, Utah and many other Family History Centers maintained by The Church of Jesus Christ of Latter-day Saints around the world. 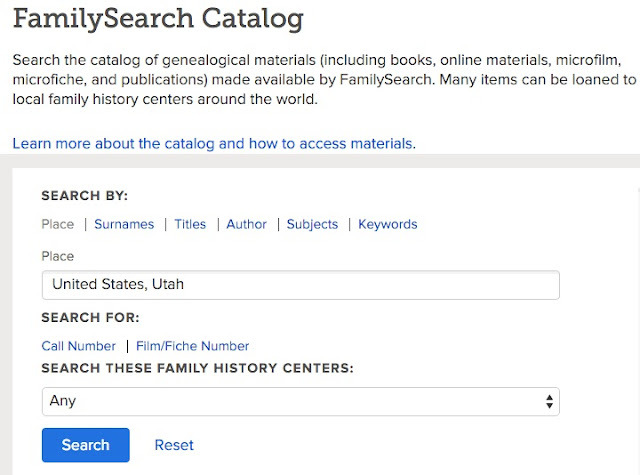 As a side note, FamilySearch is also in the process of digitizing a huge family history book collection from a number of participating libraries around the United States. This free digitized collection presently has more than 250,000 digitized books. With that introduction, I am now back to vital records. Since the FamilySearch.org Catalog contains entries for many types of records from around the world, if we examine the listings, we can see what kinds of records are generally available and the time periods when those records may have been kept. 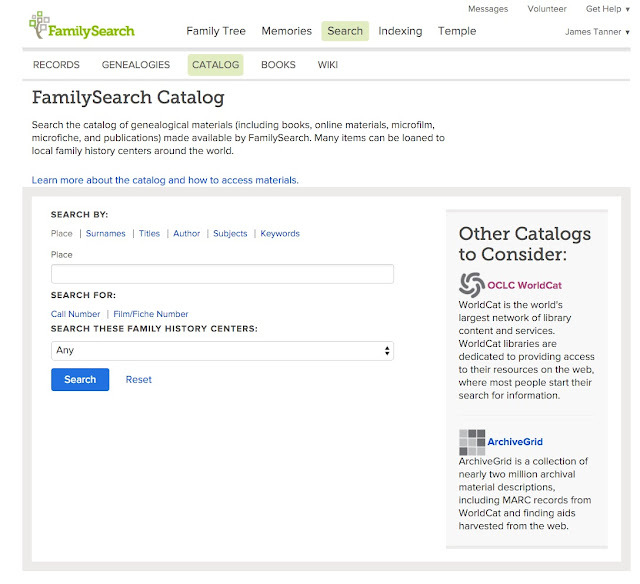 It is obvious that FamilySearch.org does not have copies of all the world's records since there are many countries of the world that have yet to allow the FamilySearch representatives to make copies of their records, but what is there contains billions of records and is a representative sample of what is available around the world. 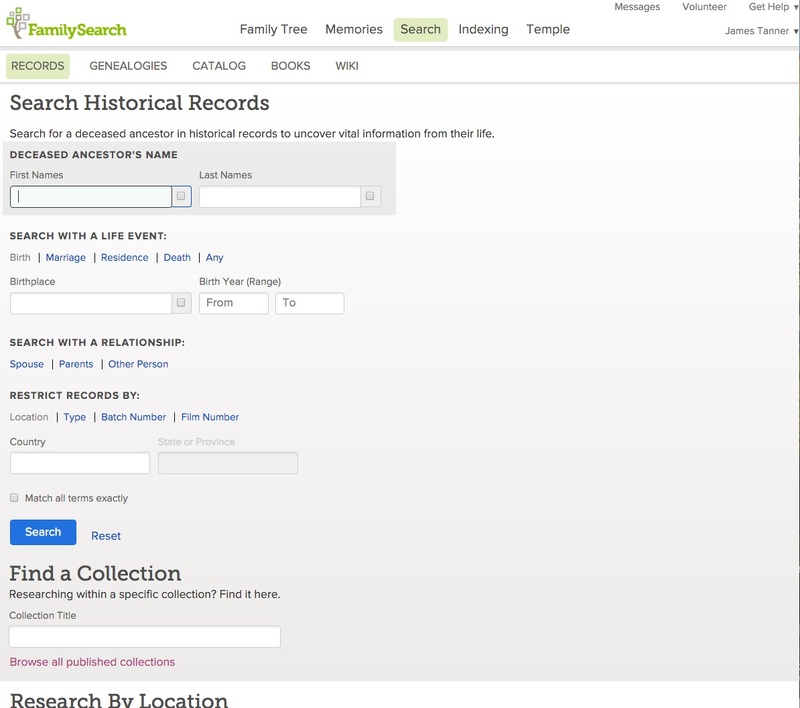 FamilySearch.org is certainly not the only place to look at the types of records available and the time periods when those records might have been kept. There are other very large online collections of the world's genealogically significant records such as Ancestry.com, MyHeritage.com and Findmypast.com and their associated companies. 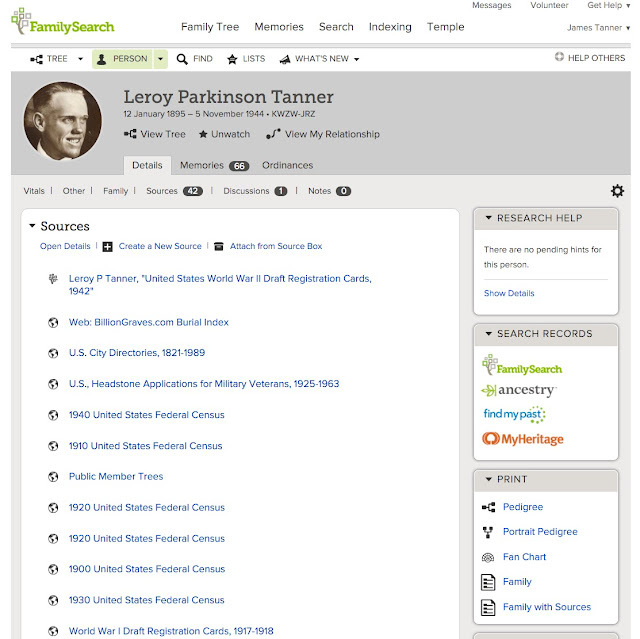 But FamilySearch.org is a free online service and has the Catalog which shows all the records grouped by type and location. 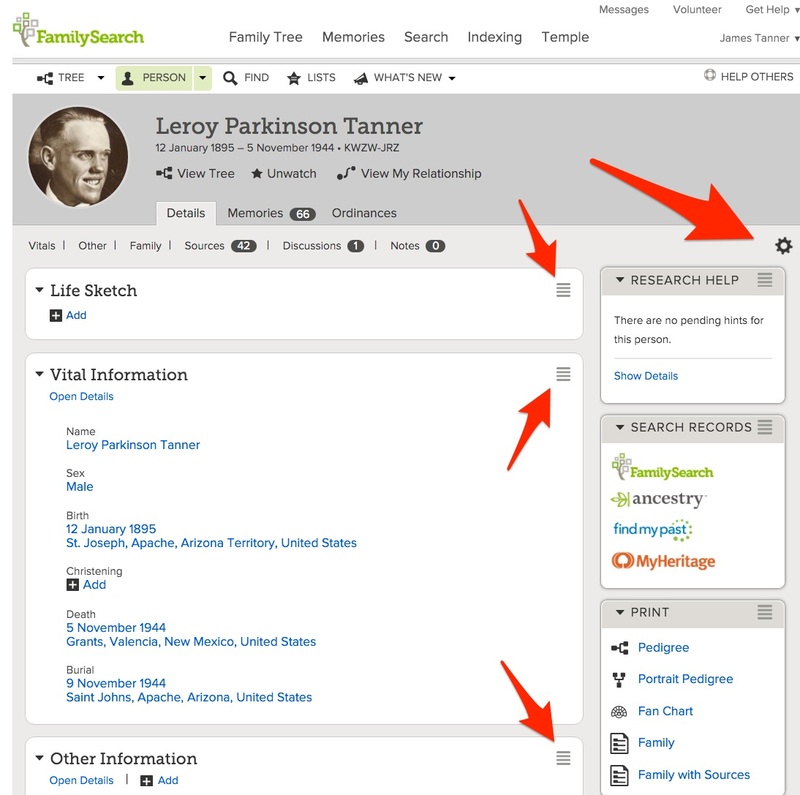 To get an idea of the availability of any one type of record, it is necessary to do a number of searches in the FamilySearch.org Catalog. The easiest and most efficient way to do this is to search by Place. I will give several examples to illustrate the time depth and availability of vital records from different parts of the world. I included a screenshot of the search page of the Catalog above. The first search field asks the user to enter a place. The idea of searching for records by location introduces the user to the reality of the way records are maintained around the world. Records have been kept by both public and private entities from nations to individuals. In the Unites States, for example, records are kept at a national, regional, state, county, municipality and local level. A thorough search for records about an individual or family must include a search of records at all the possible levels at which such records could have been kept. National records in the United States might include census records, tax records, military records and so forth. State records could include birth and death records. County records might include land and property records and marriage records and so forth. The Catalog is organized to reflect the different levels or jurisdictions that may have maintained certain kinds of records. I will start by entering the name of a U.S. state. In this case, Utah. 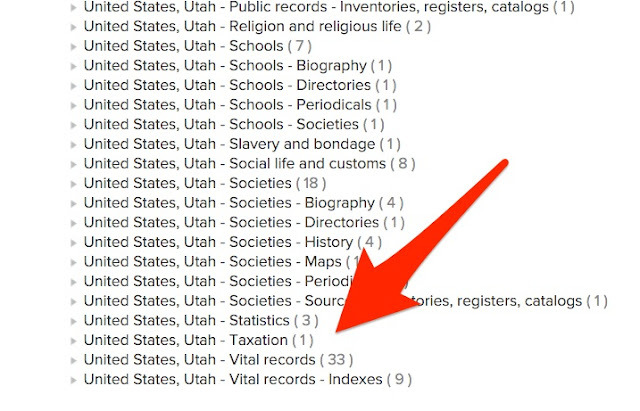 The Catalog will suggest "United States, Utah" for the search term. This level of search brings up all of the Catalog entries that have been assigned to the category for the State of Utah. If I scroll through the long list of categories of records available from FamilySearch.org and likely in the Family History Library in Salt Lake City, Utah, I will find a category for Vital Records. When I click and open this category, I can see the collections of records that are available. Contents: v. 1. A compilation of marriages from Pioneer women of faith and fortitude, 1787-1935 -- v. 2. A compilation of marriages from Conquerors of the West: stalwart mormon pioneers, 1790-1989. 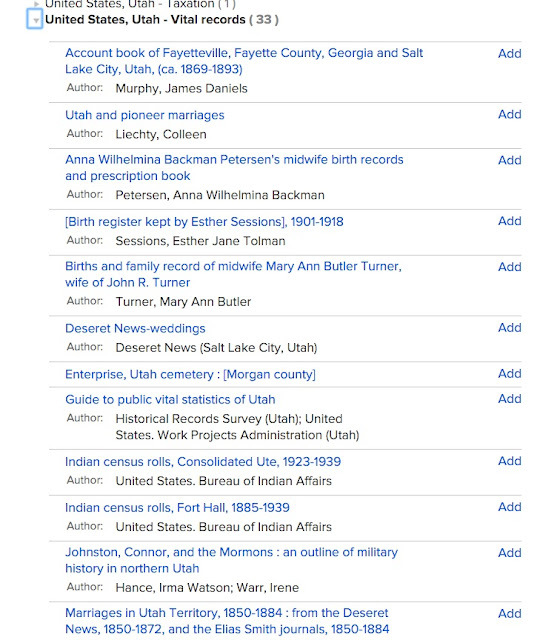 If I continue my search to Places within Utah at the top of the catalog page, I will see a list of the Utah counties. 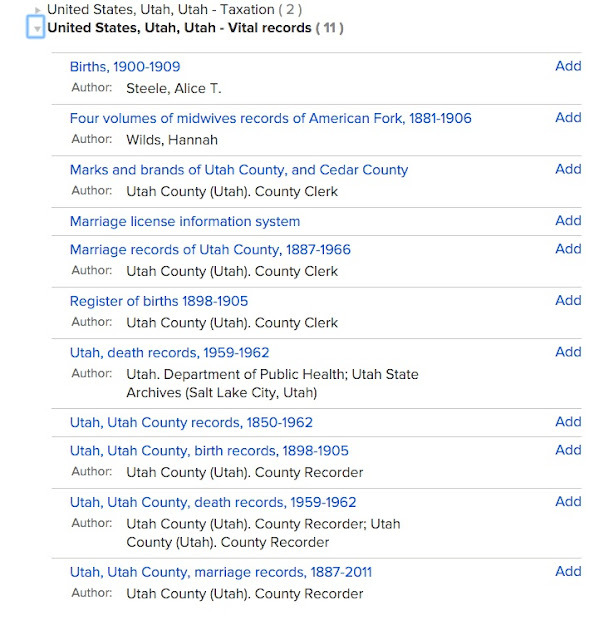 By clicking on a county, such as Utah county where I live, I can see if there are any further entries for vital records. There are 11 collections at the county level. Remember, at this point, all I am doing is determining when and where the records are available. I have yet to search for any one individual. In fact, for most of the records, such as microfilms and books, I will actually have order the items or go to the library to see the contents. The advantage of the current effort to digitize both the microfilm and the books makes these records available to be viewed online rather than incurring the time and expense of renting copies or going to Salt Lake City to see the contents. I am using the Catalog as a finding aid to learn about the availability of the records. I can see from the entries in the Catalog that the earliest dates that vital records were kept in Utah County date from 1850. 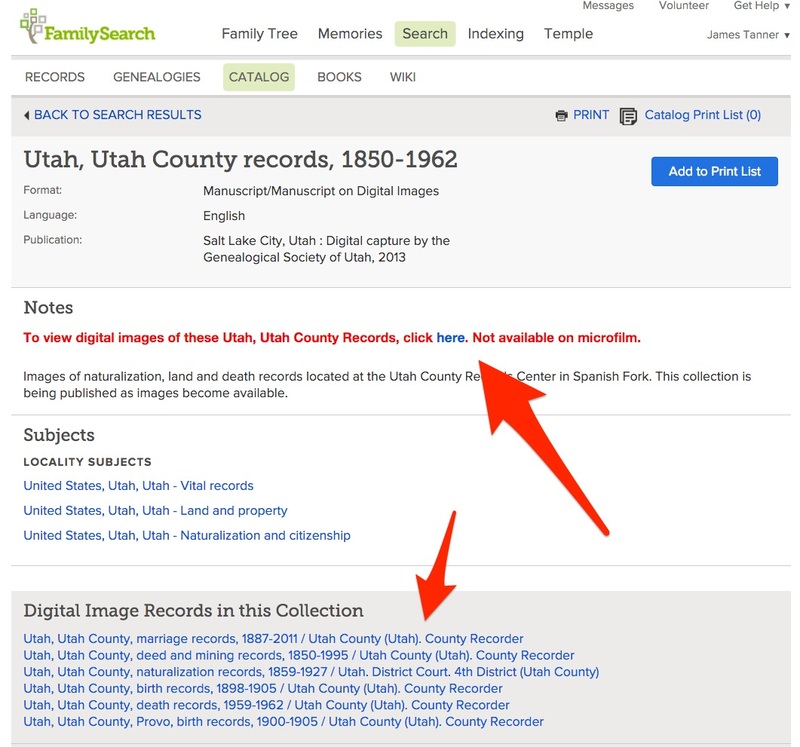 The Utah, Utah County Records 1850-1905 have been digitized and are available to search online. There is a notice in red on the description page notifying the user that these records are online. There is also a list of the individual collections included in the online collection of digital records. Remember that there will be no vital records for Utah before the arrival of the first pioneers in 1847. This is an important fact. You have to explore the history of any given area to determine when the earliest records could have been kept. Here is another example from England. Vital records maintained by the government in England began with the first efforts at civil registration. To find this information, we can return to the FamilySearch.org website and look at the Research Wiki. The Research Wiki is a user maintained compilation of information about the nature and availability of genealogical records around the world. It is a vast encyclopedia of genealogical information with more than 80,000 articles. 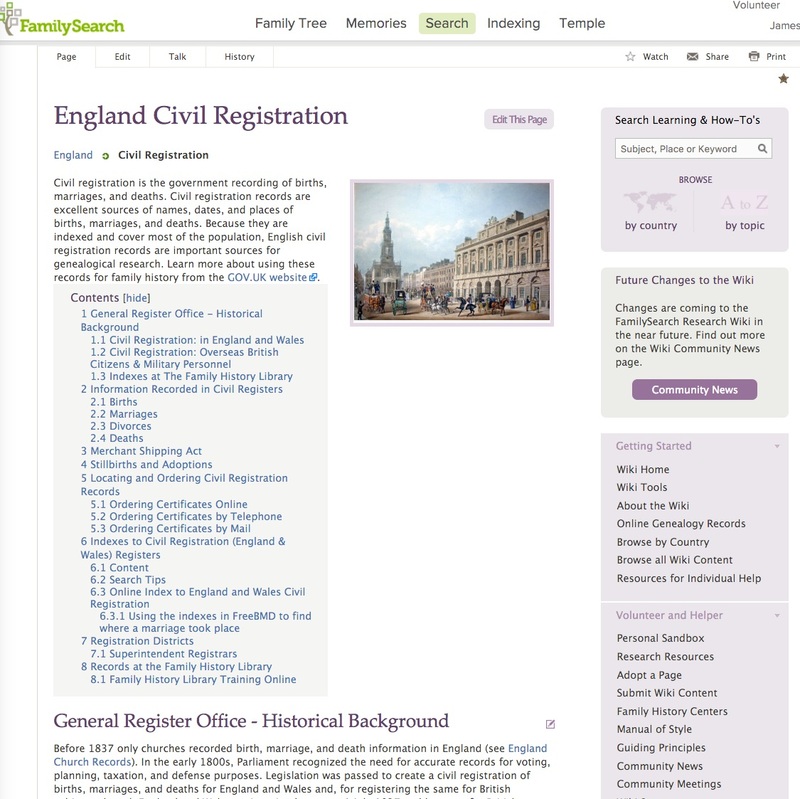 If I search for England Civil Registration, I will find that there is a specific article on the subject. 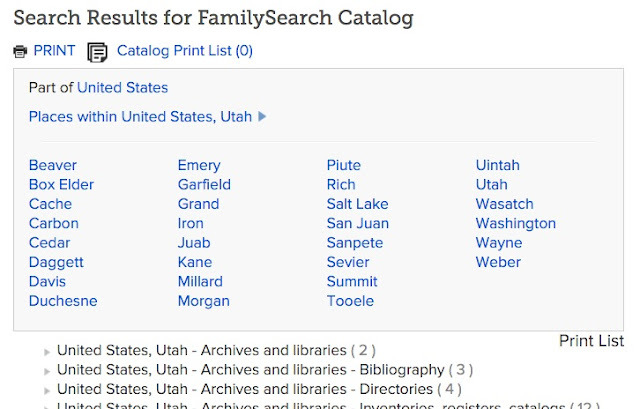 By the way, I could have looked to the Research Wiki for information about the earliest records in Utah also, but it is important to know that the same information can be discovered from looking at the catalogs of the large online genealogical database companies. We can see by this statement the availability of vital records in the Civil Registration records of England. 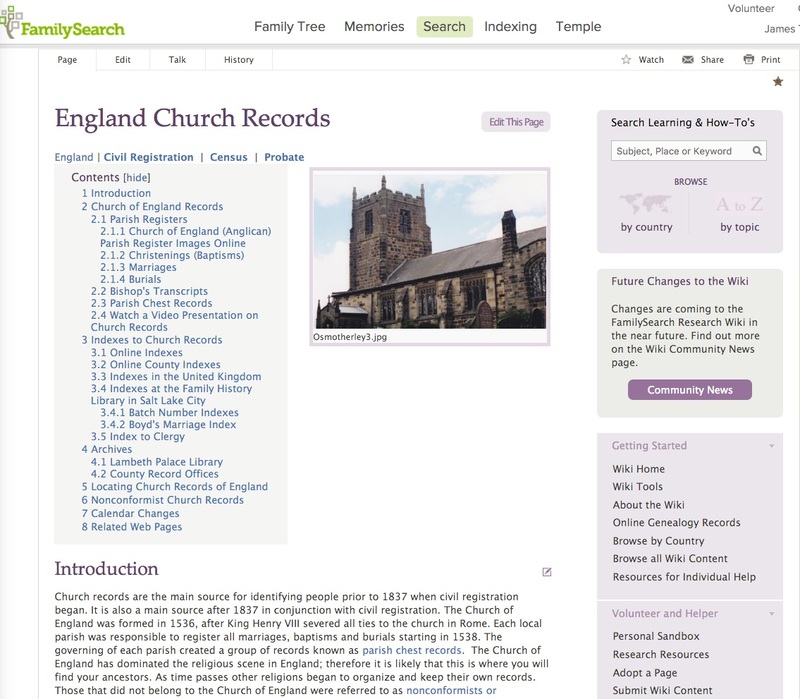 Before 1837 only churches recorded birth, marriage, and death information in England (see England Church Records). In the early 1800s, Parliament recognized the need for accurate records for voting, planning, taxation, and defense purposes. Legislation was passed to create a civil registration of births, marriages, and deaths for England and Wales and, for registering the same for British subjects abroad. England and Wales registration began on 1 July 1837 and later on, for British subjects living abroad, some records returned to England begin as early as 1790. For a brief list of all those registers of births, marriages and deaths affecting British subjects overseas, see Civil Registration of Overseas British Citizens and Military Personnel (below). This statement brings up another important fact. Vital records were not always maintained by governments. In England, churches kept the records of births, deaths and marriages long before the government became involved. This is the case generally around the world. In America, some vital records were kept by government entities such as towns and counties from the earliest times of settlement, but churches also kept such records. There is not one convenient source for birth, marriage and death records. They may appear in a variety of places and types of records. Church records are the main source for identifying people prior to 1837 when civil registration began. It is also a main source after 1837 in conjunction with civil registration. The Church of England was formed in 1536, after King Henry VIII severed all ties to the church in Rome. Each local parish was responsible to register all marriages, baptisms and burials starting in 1538. Consequentially we cannot expect to find vital records in England prior to 1538. We may find some records, but we will have to do a more intensive search and learn about different records to find birth, death and marriage information. To summarize, in every geographical area of the world there may be records of births, marriages and deaths. But in each case, there is very likely a time limit of when when those records were kept; further, we may have to search carefully to find them. Inevitably as you go back into the past, there are fewer records available about individuals. There are, of course, pedigrees such as those in China that record family lines back sometimes one or two thousand years, but these are the exception rather than the rule. We live in a world where we are virtually swimming in records. Every time I go to a doctor's office, I am asked to fill out a form that practically tells my life story, at least healthwise. Doctors are just the beginning. I have had to provide almost the same information, minus my health history, to banks, schools, the military, insurance companies, on job applications, and hundreds of other entities. We take it for granted that this information is readily provided and readily available. However, it is interesting that there are two distinct things that happen when most people start investigating their families. They either assume that no one in the past had to provide personal information or at the opposite end of the spectrum, they assume that everyone had to provide such information back into the distant past. The answer is that, to some extent, both approaches are wrong. 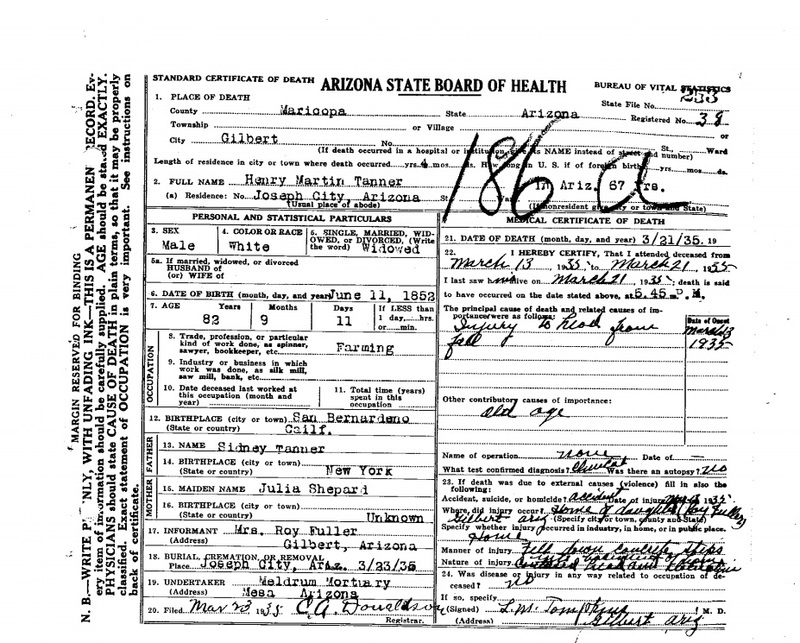 The term "Vital Records" has traditionally been arbitrarily limited to birth, marriage and death records. But even this simplistic view of certain types of records as "vital" and other not-so-vital, breaks down when you examine these categories carefully. For example, the Arizona Office of Vital records is part of the Arizona Department of Health Services. In Utah, it is not quite so clear. The Utah Vital Records are categorized under Records and Archives but the Office of Vital Records and Statistics is administered by the Utah Department of Health. The Utah Office of Vital Records supplies marriage records while the Arizona Department of Health Services refers inquiries to the Clerk of the Superior Court in the country where the event occurred. You will find even more variety of inclusion or exclusion of records across the United States and around the world. You might think that divorce records, the opposite of marriage records, would also be considered "vital." However, in Arizona you need to go to the individual county courts to obtain such records just as with marriage records. Likewise, even though marriage records are available from the Utah State Office of Vital Records, a search for divorce records is deferred to the clerks of the courts in each county. You will find the same inconsistency across the United States and searching for relatively current birth, death and marriage records can become a monumental task. One thing that is uniform across the United States is that there are charges for obtaining copies of birth, death and marriage records sometimes even when the people involved have long since died. The ostensible reason for restricting access to these records involves privacy concerns, but in reality, the states see the charges for copies of these records as a revenue stream. The cost of obtaining a copy of a vital record can vary from state to state and even, in some cases, from county to county. I might have added more, but that is enough to get things moving. To give an example of the complexity of this subject, let me ask the following question: If a death record is vital, why isn't a burial record vital? Of course I do not have an answer to the question but it does raise some interesting issues. Every single state and every single county in the United States has a different start date for when marriage, birth and death related records were required by law to be maintained and every state and every county has a different date when the records actually began to be maintained. Oh, one more level of complication. There is a rather complex industry that has arisen in the United States of private companies that sell a service of providing vital records. For example if you do a search for birth records in Arizona, you will find a long list of companies and other entities that will provide a copy of a birth record for a fee. It is sometimes very difficult to distinguish between the "official" providers of those records from the state and county governments and those who are adding on a "service" fee for ordering the records from the official government agencies. The problem is further confused when some states, like Utah, use an outside contract service to provide copies of some records. As we go back in time, there is a point when each category of vital records for ordinary people was neither required nor kept. The obvious limits in the United States involve time periods when the Europeans began settling in America, but there are limits in every country around the world. The rule of thumb for Europe is the mid-14th Century. I like to use around 1500 AD as a good cut off point for almost all records of ordinary people, as opposed to royalty and rich people, but most vital records in the United States are only common beginning in the 1800s. There are exceptions and that is what makes doing genealogical research so interesting. This particular series has all the hallmarks of going on for a while. The Contest is over. Overnight, I got emails from the first five contestants with the correct answers to the question concerning the location of MyHeritage.com's office. Of course the contest had a tricky issue. The office has moved to another small town outside of Tel Aviv and I was looking for a response about the first office mentioned. Actually all five of the first people to respond by email got the right place I just wanted to make sure they looked at the website. Sorry if you didn't get there early enough. I did get one comment to my post without an email. But I could not contact the person who made the comment because they left no email info. If you are that person and you contact me, I will try to get you a ticket. Despite what you may think, I do sleep. I will finish notifying the last of the five winners in the morning. Meanwhile, sorry to the rest, but I only have one more ticket to give away. Let's hope you are the last winner. I will probably have another contest sometime so stay tuned. Five lucky winners will get an exclusive invitation to the MyHeritage.com #RootsTech After-Party being held at the Marriott City Creek Grand Ballroom on the evening of Friday, February 5th beginning at 8:00 p.m. The Marriott City Creek is right across the street to the East of the Salt Palace. If you attend you could be the lucky winner of cash gift cards, Kindle Fire Tablets or one an iPad Mini 4. The first five readers to correctly answer the following question, by the time stamp on an email, will each win one ticket to the event. What is the name of the village where MyHeritage is based? One hint. It is in Israel. You can email me at genealogyarizona at gmail dot com Of course my email address is in the usual format. You can thank MyHeritage.com for this offer. Once I have five winners, the contest will be closed. I will announce the five winners on my blog unless they tell me not to reveal their names. You might want to check out the MyHeritage.com booth in the Exhibit Hall at #RootsTech 2016. I will be presenting at the booth on Thursday and Saturday at 3:15 pm. Look for me there. 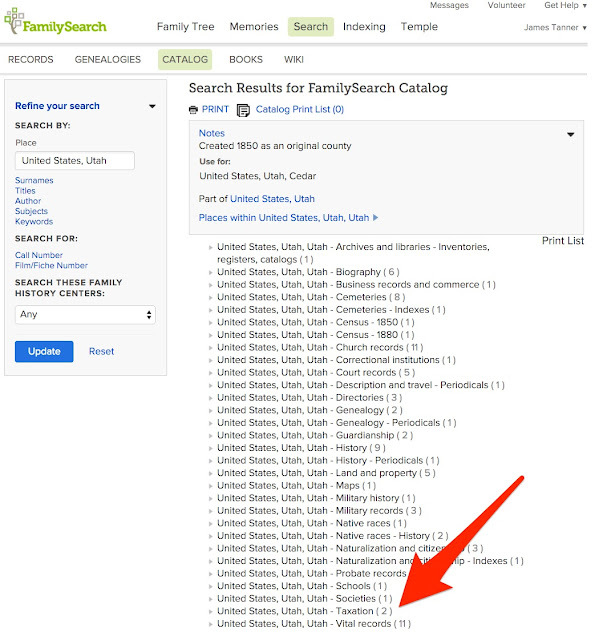 I might add that FamilySearch has already given out over 20,000 tickets for the Family Discovery Day on Saturday and I would suspect that the Salt Palace will be crowded on Saturday including the Exhibit Hall. There are still tickets available for the Family Discovery Day Event. Your regular RootsTech tickets are not enough, you need a Family Discovery Ticket to attend that part of the Conference. See the 2016 RootsTech Pass Comparison chart for more information. What is your attitude towards wars, crimes, slavery, polygamy, bigamy, infidelity, abandonment, colonial exploitation and all the complicated and disturbing issues of our world? How much of this lies hidden in the names, dates and places of your family group records? As researchers, we sometimes give token acknowledgement to some of these issues, but we are blinded by our own prejudices and those of our ancestors. I have written before about the inability of my own family to acknowledge polygamy. My Great-grandmother was the third polygamous wife of a prominent Utah leader. Her husband died leaving her with three small children. She entered into another marriage with a prominent leader from eastern Arizona and lived in dirt-poor poverty the rest of her life. Eventually she ended up living in a walk up with a shared bath facility apartment on South Temple near where we will be attending #RootsTech 2016 next week. She merits a one line reference in the extensive biographies of both husbands. It was only after I began doing intensive family history research that I began to learn about her and her family. As I help people find their ancestors, many have discovered their own tragic stories and relationships. Many have been surprised to find that their ancestors were slaves or slave holders. Much of the time, they learn about these issues for the first time. Their own relatives have managed to rewrite history and transmit only what they thought was "proper." It took me years to discover anything about my Grandfather's involvement in World War I. As it is I have nothing but a few artifacts, some photographs and a Veteran's headstone as evidence of his participation in the Mexican Border War and World War I. I know now that his unit in the Great War fought all the way from France to Germany but that is all I know about his personal involvement in either war. One of my ancestors was given a commendation for supplying his slaves to the American Revolutionary Army. We sometimes cannot imagine how our own ancestors could have been involved in such actions, especially when our own politicly correct time maintains such a tight hold on revealing only the past we want remembered. At the opposite end of the story line, as I have mentioned before in some of my writings, our family is heir to several stories such as our relationship to Daniel Boone and that one of my great-grandmothers was an illegitimate daughter of the King of England, that have absolutely no basis in fact. Years ago, while I was still in graduate school, I read the following book. Brown, Dee. Bury My Heart at Wounded Knee: An Indian History of the American West, 1970. I still have a copy of book in my personal library. Over the intervening years, I spent a considerable time reading every book I could find about the Indian Wars in Arizona, including many personal accounts written at the time or shortly after the time of the wars. Both sides in those conflicts did some terrible things, but the portrayal of the Native Americans in the Dee Brown book is solidly one-sided and ignores much of history that is contrary to the contemporary accounts. It is said that the winners write history, but it is also true that the losers re-write it when they can. How you approach the settlement of the Western United States may depend heavily on whether your ancestors spoke English, Spanish or Navajo and what you were taught about that history as a child will likely be strongly colored by your ancestry also. It is always a continual surprise to me how many genealogical researchers seem untouched by the history of their families because the never really think about it or take the time to learn about it. In my own culture, I had certain stories told about my family that I now doubt are strictly true, but I have heard those same stories repeated by relatives who knew nothing else about our family. No, I do not take the time to correct their misimpressions. I simply smile and acknowledge that we are in fact relatives and leave it at that. The story is more of a token of relationship that an actual statement about our shared history. One of the most extensive writers about my Tanner great-grandparents was the son of a polygamous family. His stories and writings reflect the reality of his times growing up with the reality of polygamy. But it is also apparent that he was decidedly unhappy with the whole situation. His attitude and the attitude of many other people who were the products of polygamous marriages has decidedly colored our own understanding of this institution. Here is a cartoon from the time when my own ancestors were actively practicing polygamy. I can assure you that none of my own ancestors had horns. I can also assure you that very, very few of my own relatives have even the slightest idea about the basis for the controversy or about the details of their own ancestors' involvement. We do rewrite history even when it is genealogy. Surprisingly, neither of the questions in this blog title are either trivial or rhetorical. They are real questions. The question about history has been addressed by historians for a very long time as an examination of the philosophy of history. On the other hand I would guess that few people who are interested in researching their ancestry start by addressing the fundamental objectives of the process. The question of "what is history" is entwined with all genealogical endeavors but seldom addressed. There are extensive writings on the philosophy of history but writings addressing the philosophy of genealogy are virtually nonexistent. In philosophy, genealogy is a historical technique in which one questions the commonly understood emergence of various philosophical and social beliefs by attempting to account for the scope, breadth or totality of ideology within the time period in question, as opposed to focusing on a singular or dominant ideology. Moreover, a genealogy often attempts to look beyond the ideologies in question, for the conditions of their possibility (particularly in Foucault's genealogies). It has been developed as a continuation of the works of Friedrich Nietzsche. See Wikipedia: Genealogy (philosophy). The philosophy of history has been applied to two different aspects of history. The critical philosophy of history is concerned with subjects such as the theories of the nature of historical evidence, the possibility of objectivity and the nature of evidence transmitted over time. The speculative philosophy of history deals with the overall significance of human history. Here are a few selections of books on these subjects. Aron, Raymond. Introduction to the Philosophy of History: An Essay on the Limits of Historical Objectivity. Boston: Beacon Press, 1961. Atkinson, R. F. Knowledge and Explanation in History: An Introduction to the Philosophy of History. Ithaca, N.Y.: Cornell University Press, 1978. Hegel, Georg Wilhelm Friedrich, and Robert S Hartman. Reason in History: A General Introduction to the Philosophy of History. New York: Liberal Arts Press, 1953. Hegel, Georg Wilhelm Friedrich, and Leo Rauch. Introduction to The Philosophy of History: With Selections from the Philosophy of Right. Indianapolis: Hackett Pub. Co., 1988. Stanford, Michael. An Introduction to the Philosophy of History. Cambridge, MA: Blackwell, 1998. Sullivan, John Edward. Prophets of the West; an Introduction to the Philosophy of History. New York: Holt, Rinehart, and Winston, 1970. Walsh, W. H. An Introduction to Philosophy of History. London; New York: Hutchinson’s University Library, 1951. Socrates is quoted in Plato's Apology as stating that the life which is unexamined is not worth living. By this I understand and believe that we cannot make progress in this life or the next without asking questions and resolving the issues raised by those questions. In this context I am raising the question of "what is genealogy?" As genealogists we have too long divorced ourselves from addressing the fundamental assumptions and philosophical foundations of our pursuit. We need to move into the mainstream of historical inquiry and tackle the hard questions that confront the genealogical researcher rather than be satisfied with a simplistic veneer of legal and scientific jargon. Salam, Abdus, P. A. M Dirac, Jonathan Evans, and Gerard Watts. Unification of Fundamental Forces: The First of the 1988 Dirac Memorial Lectures. Cambridge [England]; New York: Cambridge University Press, 1990. Another quote is in order here from the following book. Carr, Edward Hallett. What Is History? New York: Knopf, 1962. History [and I might add genealogy] consists of a corpus of ascertained facts. The facts are available to the historian [genealogist] in documents, inscriptions and so on, like fish on the fishmonger's slab. The historian [genealogist] collects them, takes them home and cooks and serves them in whatever style appeals to him. We need to go beyond being reasonably exhausted and start to examine the basic tenets of genealogy. Unlike Socrates I do not have anyone with whom I can carry on a dialogue so I am opening one here. For the past few years, I have been thinking about this topic and have addressed it from quite a few different angles. It is now time to move my one-sided discussion into the main stream of historical philosophy for, after all, genealogy is nothing more or less than our own personal history. I apparently published the first paragraph of this post before I finished the rest. Oh, well. We all get older. Genealogy has only recently in some quarters become accepted as an "academic" pursuit. In the United States there is only a handful of colleges or universities that award a degree in genealogy. History is usually lumped in with Social Sciences (Studies?) or Liberal Arts. According to the U.S. Department of the Census, in 2005 only 5.6% of the Bachelor's Degrees awarded in the United States were for history. Unfortunately, there is a gulf of misunderstanding between those who profess being "professional" or "certified" genealogists and what is commonly accepted as genealogy or family history activity. There is also a substantial gulf between genealogy as pursuit, professional level or otherwise, and what is taught in universities as history leading to an academic degree. The only university level course description I could find leading to a Bachelor of Arts degree in family history is from Brigham Young University, an accredited university. There are two other possible degree programs in the U.S. neither of which is accredited or associated with an accredited university or college. There are several "certificate" programs that do not produce a certificate that is applicable to an accredited degree. The Program Requirements for a BA in Family History at BYU include classes in writing, rhetoric, logic, statistics, world civilizations, family history studies, the historian's craft, many classes in family history by area such as northern, southern and colonial American research, one language class and choice of social or cultural history courses. There is also a research seminar requirement. You would have to complete all of the general graduation classes also. I would venture a guess that few genealogists, other than those who have completed this course of study at BYU, have taken such a broad spectrum of courses to qualify themselves for the process of doing family history. Personally, I took about five years worth of courses from the BYU Independent Study Department in addition to my own personal reading and study and years of practice. But I do not charge for my services and do not belong to any "professional" organizations although I have in the past. I only make note of this because I feel that the type of program offered by BYU should be the basis for any discussion of either professional certification or professional standards. Nearly every certification program I am familiar with has an educational requirement. I had to attend and graduate from an accredited law school to take the Bar Entrance Examination in Arizona to practice law. I also had to take an extensive course of study and sit for a qualifying exam to obtain a real estate license in Arizona. I am familiar with both the education and test requirements for a contractor's license and other the exams for accountants. I could go on to cite the classroom, individual study and testing requirements for many other professions. If genealogists want to be take seriously as professionals and as academics, they will have to establish a structured educational and testing service. Both as an attorney and as a real estate agent I was also required to maintain a certain number of in class hours each year to continue my certification to practice either profession. I could join a genealogical professional organization by simply paying my dues and agreeing to their ethical code. Although there are at least two organizations that certify genealogists, neither has an in-class study requirement and neither has the broad base of the BYU BA program. I do not say this to denigrate the genealogical accreditation or certification process, but to point out that neither program would be accepted as a credential for teaching at the college or university level. In fact, if I or anyone else wanted to seek an academic position teaching family history, an accredited university or college would require an advanced degree and for a full-professorship, a doctorate degree. There have been attempts by some educational institutions to accept "life experience" as qualifying for some or all of the requirements for a degree. Many of these programs are branded by critics as "diploma mills" and such do exist. At one time we were familiar with an organization in Sedona, Arizona that had a short study course and awarded Ph.d degrees in life experiences. I was well aware of a prominent local cleric in the Phoenix area that claimed a Ph.d and referred to himself as a "Doctor" who obtained both degrees from mail-order diploma mills. The purpose of accrediting universities and colleges is to prevent this kind of activity. Many BYU graduates in family history also obtain one or more certifications from the genealogical certification organizations, but a BA degree even with both certifications would still fall short of the entrance requirements for obtaining a professorship at a university. By the way BYU-Idaho also has an online degree in family history, but neither a BA degree from BYU or a Family History Certificate from BYU-Idaho is sufficient to obtain certification or accreditation. In making this observation, I am not writing about obtaining employment. Job requirements vary considerably and many employers look for experience and competence over degrees received. The are unemployed people with advanced degrees. Employment and academic recognition are two different things. I have know some very successful and wealthy businessmen who had no formal academic training. A genealogist who obtains certification or accreditation may be perfectly qualified to perform professional services for clients. They may also become well employed by genealogically related organizations, but the doors to academia are closed to them. For years I taught at a local community college and observed the politics involved in their employment practices. A degree was the entry ticket, but being hired as a professor, other than on a part-time or adjunct basis, depended almost exclusively on politics not experience, qualifications or ability. If I wanted to teach history at a university level, as opposed to a community college level, I would also need at least a Masters Degree and if I wanted to advance and become a full-professor, once again I would need a doctorate degree. Genealogy is not accepted as a full-fledged academic study because there are so few college or university level programs available and no advanced degrees in genealogy in the United States. I happen to have a recognized doctorate level degree. Setting aside the fact that I am past the age of mandatory retirement at most universities, could I get a job as a professor? Even in law, the fact is that there are extremely narrow requirements to advance academically and obtain a position at an accredited law school. Most professors have not only obtained a law degree, commonly a Juris Doctorate or J.D. degree, but also excelled in their academics and in most cases pursued clerkships for prominent judges and/or advanced law degrees. I could also add gender and minority status considerations but that is another issue altogether. The real issue here is whether or not genealogy as a pursuit can develop the type of acceptance and credibility that would cause any accredited universities to develop programs that would lead to advanced degrees. I do not see that happening. Can genealogists themselves develop standards and educational programs that can produce a credible, academically based and universally accepted program? Presently, there does not seem to be any such effort being made. It took over hundred years from the law profession in the Unites States to evolved into the regulated profession it is today. Likewise, the medical, dental and other professions have gone through the same processes. But all these professions have entrenched client and patient bases and wide appeal. Genealogy per se has no such client base or appeal. There are no children growing up wanting to be rich and famous genealogists. Genealogists have a distinct tendency to obscurity and poverty with a few exceptions for those employed by large genealogical companies. In the United States, genealogy is more a commercial enterprise than an academic one. When I accidentally published the first paragraph of this post, I got a very interesting comment to the first paragraph. I reproduce the comment here from Nancy so that it will not be lost. I originally intended to write about the theories that dominate historical writing and will do so in the near future. I am presently reading background material concerning the philosophy of history and will likely start writing about historical trends and how they affect the genealogical viewpoint. I guess my basic question is if genealogy is history then why are so few genealogists aware of history? In a comment on the comment above, each of the professions noted, archivists, librarians, lawyers etc., have their own academic degree programs and qualifications. I often regret that I did not get an advanced degree in library science rather than law (or both). But I was under the economic necessity of making a living and supporting my family at the time. We have been planning and looking forward to RootsTech 2016 and the associated workshop and Innovators Summit beginning on February 2, 2016. During the past two weeks, I have also been teaching a series of classes about online digital book collections. Accordingly, I have been thinking about the impact of digitization projects on genealogy in general. Unless you live in a cave all by yourself, you can hardly be unaware of the progress of digitalization. Whether you buy in or opt out, you can hardly ignore the proliferation of cell phones, digital billboards and other in-your-face kinds of changes. In genealogy, the changes with the most impact involve the growth of online databases with billions upon billions of digitized records. Further, unless you are in the opt out category, you are probably using a computer and at least a smartphone or a tablet for a part of your genealogical work. But the changes accompanying this digital age are deeper and more pervasive than just the proliferation of gadgets. Of course, I have been talking about RootsTech 2016 with nearly all of my associates and friends in and out of the genealogical community. But I am observing an interesting change in attitude. In years past, most of those who heard about the Conference were either planning on attending or wishing they could go. But recently there has been a subtle shift in the responses. Many of the more involved genealogists are deciding to stay home and watch the proceeding on their computers or later watch the recorded sessions. They give a variety of reasons including the inability to choose classes they like and the fact that classes have been filled to capacity. They also are overwhelmed at the choices offered and, if they have been before, comment on the crowds and difficulties of transportation and walking about. There really are few places in the Salt Palace to sit when there are thousands of people milling about. I doubt that those attending the Conference this year will notice any change in the numbers. If anything, there will probably be more people attending than ever before. RootsTech 2016 is locally being advertised on billboards along the freeways and through every other media. This has not happened so much in past years and the added visibility of RootsTech 2016, will very likely have an impact. But general media advertising is not aimed at the "typical genealogist." The free "Family Discovery Day" on Saturday, February 6, 2016 will likely attract more attendees than the rest of the Conference. RootsTech 2016 is really three separate conferences combined in one venue at one time. This is not bad but for the core of genealogists who would be interested in attending, it appears that there is more emphasis on attracting non-genealogists than emphasizing the community. This shift mirrors the deeper changes in genealogy caused by the digital shift in our society. Historically, those who were interested in researching their family history had to park themselves in libraries and archives to do their research. They needed to be dedicated researchers to make any progress in their efforts and spend a great deal of time writing letters to find documents and information about their families. Those days are past. With very few exceptions, today I could do more than 90% of the research I did over the space of fifteen or twenty years, in a few hours over a few weeks online. 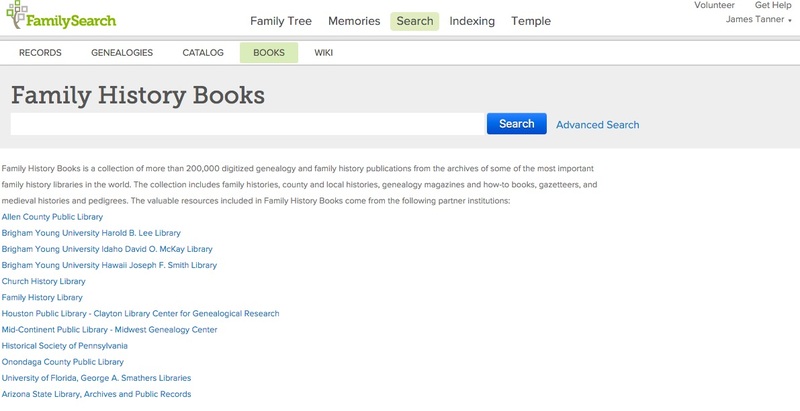 Because more experienced genealogists are confronting difficult research issues that remain difficult despite the digital world's assistance, they tend to think about those difficulties rather than focusing on the amount of more easily obtained information now available. In my own case, I am well aware of the limitations of the online database programs for the simple reason that I am doing research in the 1700s and 1600s. Today, many people can make significant progress in discovering their family in a much shorter period of time by working online. This is where RootsTech 2016 is today. They are reaching out to those who now can find their families using the digital tools we have right now. But those who have worked on their family history for years and provided the base of information used by those who are coming to family history presently, are finding less and less to help them with their particular focused efforts. As such, RootsTech 2016 is not about genealogy at all. Here is the reason given to attend RootsTech 2016 from the website. RootsTech, the largest family history event in the world, is the perfect place to discover, preserve, and share your family stories and connections across generations. With a line-up of world-class speakers, thrilling entertainment, over 200 engaging classes, and a huge expo hall, there’s something for everyone, no matter the age or skill level. 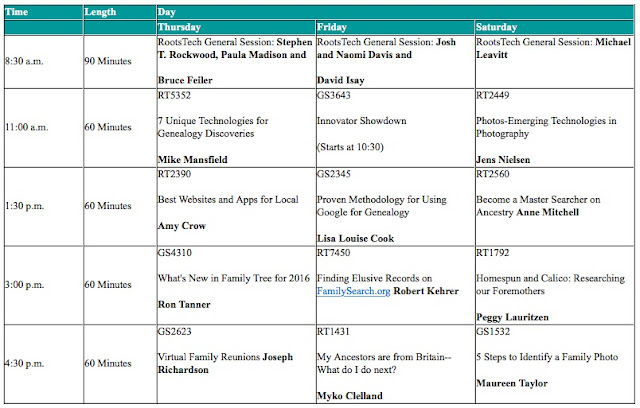 For a confirmed genealogist, there are some really good reasons to come to RootsTech 2016 but those reasons may be entirely different than they were just a few years ago when the keynote speakers were representatives of the major genealogy companies and the focus was on genealogy and technology. I will still have an opportunity to see the technology side of the genealogical community at the BYU Family History Technology Workshop on Tuesday, February 2, 2016 here in Provo, Utah and the Innovators Summit on Wednesday, February 3, 2016. The rest of the "tech" in RootsTech 2016 will likely be on the Exhibit floor. Tellingly, if you use the filters provided for the list of classes, to filter the list of 291 classes, and click on the advanced Technology Skill Level, you will find 5 classes listed. Here are the numbers of classes with different filters. What about duplicate entries in family trees? What Happened to Genealogists Going Paperless? Did I say food? I meant it when I said it. What food did your ancestors eat?